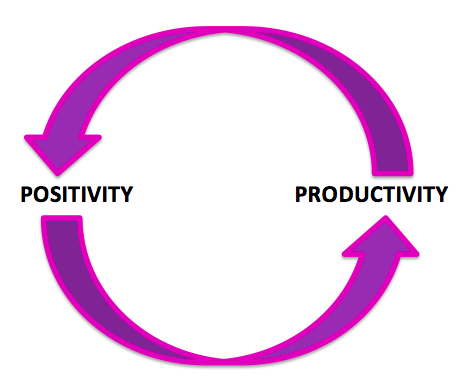 In My Humble Opinion productivity proceeds from positivity. When was the last time you congratulated yourself for completing a task; be it cleaning the cooker, going for a run, or reading a journal article? When was the last time you beat yourself up for still not having done X or for not having done a good enough job of Y? Maybe you can’t remember the answers to either of these questions. That doesn’t matter. But do pay attention to your self-talk in the hours and days ahead and see how you talk to yourself. I’m willing to bet that you will find that, like me, you’re much quicker to beat yourself up than you are to praise yourself. Well, I’ve been thinking about this, and I reckon that negative self-talk is a barrier to productivity. Because whilst we’re talking ourselves down and scolding ourselves, we’re focusing on all the things we’ve not done, we’re not actually getting anything done and we are putting ourselves in a negative mindspace. Imagine the flipside of this though. In my experience, when I’m more positive in my self-talk, acknowledging my achievements and praising myself for them, it focuses my attention on what I have achieved. And when I’m in this mindset I feel more positive, and that spurs me on to get more done and be more productive. It’s a merry circle of productivity. Be more positive in your self-talk: be kind to yourself and praise yourself for every achievement no matter how big or small they are.